We’d love your help. Let us know what’s wrong with this preview of Ghosts and Grisly Things by Ramsey Campbell. Ramsey Campbell's novels have justly won him acclaim as one of the best writers of the age. A three-time winner of the World Fantasy Award and an eight-time winner of the British Fantasy Award, his writing has struck a chord with readers worldwide. But throughout his career he has also written insightful, terrifying, and disturbing short fiction. 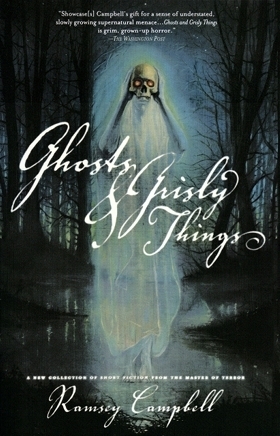 Ghosts & Grisly Things is a collection of the best of Campbell's short works from the past two decades. This book also features the story "Ra*e" which appears here for the first time anywhere. To ask other readers questions about Ghosts and Grisly Things, please sign up. This is the Tor hardcover edition. “Between the Floors” (Destina This is the Tor hardcover edition. I sometimes wonder where books get their titles. In this case, I have to lay the blame on some copy editor at Tor who hadn't even bothered reading the manuscript, or at best skimmed it a tad. There's the odd ghost in this collection of stories, and a grisly thing or two, but anyone who's read Ramsey Campbell before should be well aware by now that the horror which Campbell makes his stock in trade has far less to do with such external fear-inducing stimuli. Stephen King writes in the opening pages of Cujo about how our fears change as we grow older, how the monster in the closet becomes the horror of not knowing how you're going to pay the rent on time. Within that perspective, Campbell is very much an adult horror writer; while his characters find themselves in widely disparate situations doing widely disparate things, the horrors that plague them are usually those who invoke the same fear as not knowing whence the rent check. And perhaps this is why Campbell has yet to find the audience in America that King and his monsters or Koontz and his aliens have found. When the monster is something other than the average Joe (even if he's a serial killer or some other damaged version of humanity, he's still "other"), there's a cushion of safety against which the reader can lean. When the monster is a guy on a cell phone ("Going Under"), a return to one's hometown ("Welcomeland"), or the banal passengers you're stuck with on the train ("Missed Connection"), you can't help but identify. We've all been there and done that. A collection of Campbell's short stories. He's the master of dingy, claustrophobic horror -- these stories are peopled with petty, small individuals who get caught up in horrors they can't begin to understand, even though in most cases they've brought them on themselves. Often, the normal humans are almost as awful as the supernatural horrors haunting them. I utterly enjoyed this collection, even though I felt vaguely like I needed a shower afterward. I've never been much of a fan of short stories. I mostly find them lacking and a little bit rushed, like a journey you've barely started to enjoy ending abruptly and leaving you wanting for more. Thus, I start this review saying to myself that it may have been a bad idea for me to read the short story compilation "Ghosts and Grisly Things" from an author as legendary as Ramsey Campbell, without having read any of his novels, nor been acquainted with his writing style. To start off, Ramsey Campbel I've never been much of a fan of short stories. I mostly find them lacking and a little bit rushed, like a journey you've barely started to enjoy ending abruptly and leaving you wanting for more. Thus, I start this review saying to myself that it may have been a bad idea for me to read the short story compilation "Ghosts and Grisly Things" from an author as legendary as Ramsey Campbell, without having read any of his novels, nor been acquainted with his writing style. To start off, Ramsey Campbell's writing is the kind of writing you don't read when you're tired or about to go to bed. His prose demands your fullest attention and imagination. You get sidetrack for one bit and you're left confused in a sea of words, slicing through drifts and waves with no direction; no sight of a distant shore. On the other hand, if you give his stories the attention and thought they deserve, you are going to experience spine tingling horror the likes of which you have never felt before. Rather than detailing carnage and grue, Ramsey Campbell writes the sort of horror stories that slowly suffocate you to death all the while convincing you that this is perfectly normal and reasonable and why on earth are you frightened? The tales which make up Ghosts and Grisly Things span Campbell's career from the early 1970s to the mid 1990s. A constant recurring theme is just how close the mundane, everyday world can exist to unimaginable terror when one considers how easily one may slip into Rather than detailing carnage and grue, Ramsey Campbell writes the sort of horror stories that slowly suffocate you to death all the while convincing you that this is perfectly normal and reasonable and why on earth are you frightened? The tales which make up Ghosts and Grisly Things span Campbell's career from the early 1970s to the mid 1990s. A constant recurring theme is just how close the mundane, everyday world can exist to unimaginable terror when one considers how easily one may slip into nightmare. Campbell's characters often experience a surmounting fear which manifests itself through the play of shadows and light, creeping doubt and an abject belief in the existence of something outside the normal plane of existence. This book was a bit difficult to get into, but I think this was more due to cultural differences than actual the writing. Even though most of Campbell's stories took place after 1975, some of the references were as foreign to me as reading Poe or some other century old horror novel. Some things Campbell seems to focus on: fog, loss of control, mental insanity. I suppose for him, the sense of losing oneself to insanity is a lot more horrible than anything that may be hiding in your closet or unde This book was a bit difficult to get into, but I think this was more due to cultural differences than actual the writing. I suppose for him, the sense of losing oneself to insanity is a lot more horrible than anything that may be hiding in your closet or under your bed. The best stories (In my opinion) were 'A Street Was Chosen' (The lab report style of writing made this story super creepy), 'See How They Run', and 'Ra*e'. This is a collection of short stories by Campbell. Personally I didn't care for most of them. These are the sort of story where it's all about the ending, and the endings were usually not satisfying. I suspect maybe Campbell's novels are better.